Some of Scrutiny's coolest tricks may not be terribly well documented, so I thought I'd start a series of articles here. 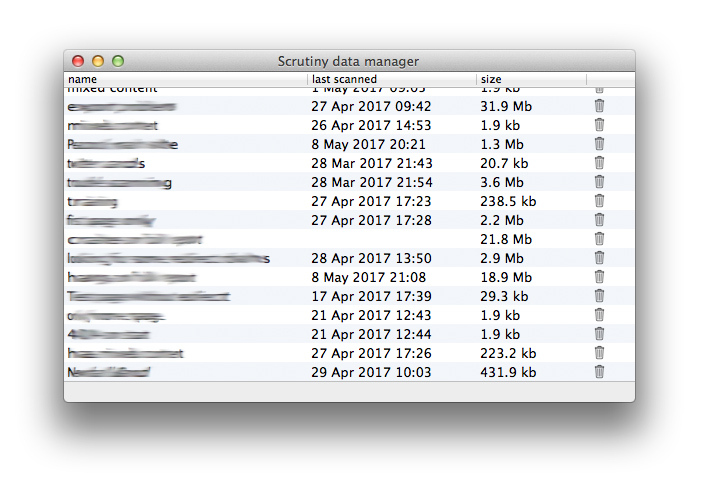 Previous versions of Scrutiny had an 'Autosave' checkbox. With the feature turned on, any data that was in memory would still be there after quitting (deliberately or unintentionally) and re-starting the app. In Version 7, the same option is there but the app goes much further. With the feature switched on, Scrutiny will save the data from the most recent crawl of each site. This means all data; link check results, sitemap, SEO data, spell check, everything. If crawl data exists for a site, then you'll see the database icon with the site's configuration. This takes you straight to the Results selection screen. Since version 7.3 this feature is on by default for new users. So if you are scanning very large sites and short of disc space, you may want to switch the feature off (note that you can still save and load data manually using File > Save data and File > Open). 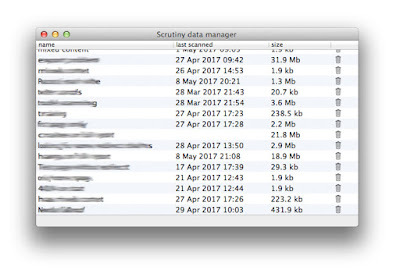 But you may not want to switch Autosave off, because this window (below) shows the data that Scrutiny is keeping (with dates and sizes) and you can use this 'data manager' to selectively trash the data that you don't need. The table can be sorted by size, scan date or website name.